Serving all of Hartford, Litchfield, Middlesex, New Haven, New London, Tolland, and Windham counties, including the following cities: Glastonbury, Avon, West Hartford, Farmington, Granby, Bridgewater, Roxbury, Washington, Salisbury, Cornwall, Fenwick, Essex, Killingworth, Old Saybrook, Cromwell, Woodbridge, Madison, Bethany, Orange, Middlebury, Lyme, Stonington, Old Lyme, North Stonington, Salem, Tolland, Bolton, Hebron, Andover, Ellington, Woodstock, Hampton, Pomfret, Ashford, Chaplin, and the entire surrounding areas. Watch Peter Kostis, Top 100 Instructor and CBS Analyst, showcase his personal synthetic backyard putting green! Free Backyard Putting Green Design Consultation. Call Toll Free (203) 589-7528. Celebrity Greens Hartford was selected as the Authorized Dealer, Designer and Installer of Artificial Grass, Artificial Turf and Artificial Putting Greens for Hartford, Connecticut and the surrounding area. Celebrity Greens only installs proven artificial grass products that are environmental-friendly, extremely durable and will stay gorgeous for years to come. 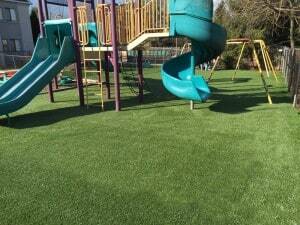 The highest quality, environmentally friendly, artificial turf products available! We only offer the very best synthetic grass products, and they’re manufactured right in America. We never use cheap Asian imports. We are partnered with the best manufacturers in the artificial grass lawn industry. Our exclusive relationship allows us to offer you the varieties of synthetic grass products that meet the highest standard in artificial turf manufacture, longevity and durability – Our customers have peace of mind, a beautiful yard or backyard putting green and we provide them with a manufacturer 8-year synthetic turf warranty. These artificial turf products are completely lead-free and come with environmental benefits that have been well documented throughout the years. Along with the clear benefit of no longer mowing or fertilizing, our artificial turf installations will save the average home owners a massive amount of water each year. In addition to lush, green lawns we also install all sports surfaces, as well as certified playground surfaces, and we specialize in designing and installing the most advanced sand filled, artificial grass putting greens available today. Our PGA-tour-caliber putting greens can be installed indoors and outdoors. 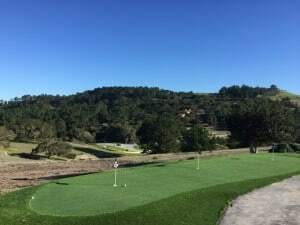 We offer a large variety of design features including sand traps, water hazards, custom lighting and many other amenities to excite your game of golf. 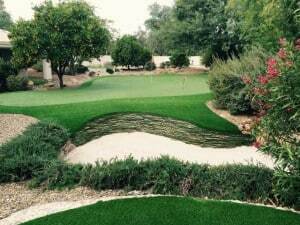 If you have a unique landscape project that involves artificial turf and you want the best quality turf installed by the most capable, highly trained team of designers and installers, then you have come to the right place. Celebrity Greens Hartford offers complete landscaping services, and we are proud to offer products that require very low-maintenance while remaining lush and green through every season and all weather conditions. Contact us today at (203) 589-7528 for a free consultation!